There are a number of curious items to be aware of when reviewing your business phone service bill. 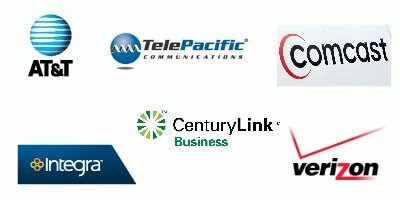 It doesn’t matter if your bill is coming from Verizon, CenturyLink, AT&T, Comcast or a competitive local exchange carrier like TelePacific or Integra. If you’ve spent any amount of time working in the telecom industry, you’ve fielded a first bill phone call. The customer is upset because he or she just received a bill for an amount much higher than expected. 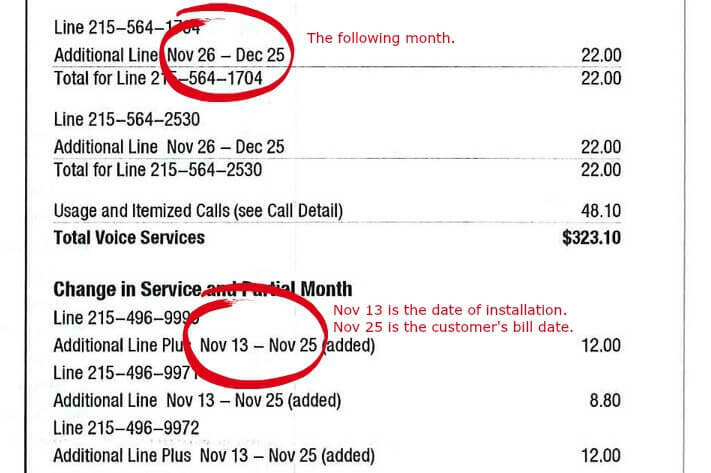 That’s because telephone companies bill a month in advance, so a business is billed from the installation date to the bill date and the next month. Add in taxes and surcharges, which are almost never quoted, and a first bill could total more than two times the amount that was listed on a sales proposal. 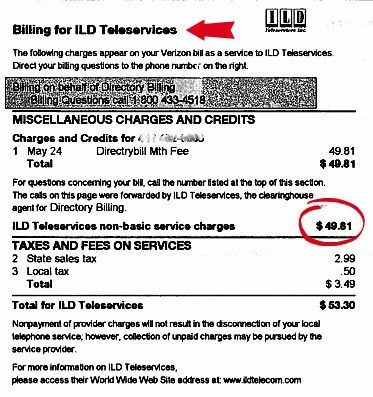 “Taxes and surcharges” are business telecom’s version of “death and taxes.” Every carrier includes them in their billing but they can vary substantially. This company’s provider tacked on an additional $152.85 in monthly fees. That’s a figure over 41% of cost of the actual service. Providers do this to make their prices seem more competitive. Many customers believe that carriers have no control over the taxes and surcharges collected and don’t include them when they compare their current costs to the amount another company is proposing. But carriers aren’t required to collect taxes and surcharges from their customers; they’re only required to pay them, and surcharges are completely subjective. The only figure that isn’t subjective is sales tax. The examples above are all phony, made-up charges that some carriers include in their billing. They’re strictly a money grab. They’re not contracted amounts, hardly ever quoted and almost impossible to remove. Knowing of their existence can lead to obtaining accurate pricing in the proposal stage and more relevant pricing comparisons. Another charge to be on the lookout for is Wire Maintenance. Wire Maintenance is completely unnecessary if you own a business phone system. It only covers your inside wiring. Not much can go wrong with that but if you own a business phone system you probably have a phone vendor. Your phone vendor would be the company to call if you had trouble with your phones. If you own a business phone system, are experiencing trouble and call the phone company, they won’t be able to help you. In this example, the wire maintenance fee is only $9.50 per month but that’s per month and if a business has multiple locations with multiple phone lines, the cost can mount up. 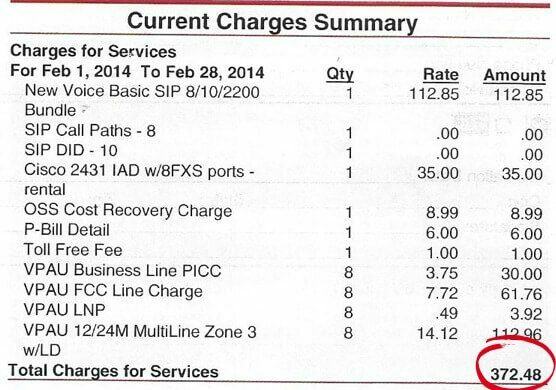 You’ll only find these on an incumbent carrier’s (AT&T, Verizon, CenturyLink) phone bill. Typically they’re for services you didn’t order and never used. The third parties hope their victims unknowingly pay their phone bills each month. Regulatory agencies required incumbent phone companies to collect these fees because they felt that the phone companies had an unfair advantage with their monthly billing. Of course, unscrupulous people figured a way to take advantage of the mandate. The following example is an illustration of how much a company name can differ and why it’s important to reference a phone bill when completing a Letter of Authorization or Toll Free RespOrg. A business might utilize the same provider for years and go through a number of name changes. If they then decide to change providers, they might have their request denied because their names don’t match. The losing company seems to always wait until the last minute to reject a telephone number port. That can add weeks to a service transition. If you need help deciphering your business phone bill or would like to reduce the cost of your services, contact CarrierBid today or complete the web form on the right side of this page.